Pop Dot Comics is a fun way to create comic-book style illustrations from your snapshot or ones taken of your friends and family. Pop Dot Comic applies thick outlines, bold colors, and plenty of benday dots to newsprint or pulp papers to give every creation the look of one that’s been printed or published. In the past, halftones were tediously inked in by cartoon artists or created in darkrooms. 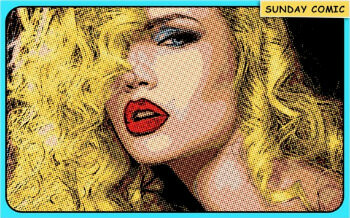 With Pop Dot Comic you can easily and quickly convert your photo into a comic book drawing that is worthy enough for the Sunday newspaper or your favorite pulp-fiction cover. One-touch settings will automatically transform photos into a professional looking comic illustration with halftone. An included library of visual sound effects along with editable speech bubbles gives every Pop Dot creation POW!